Schenectady City Hall is located at 105 Jay Street, Schenectady NY 12305; phone: 518-382-5000. 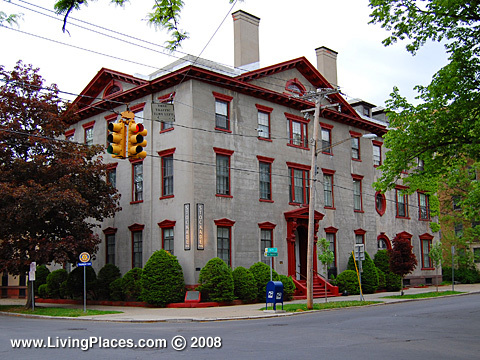 Photo: The Stockade Inn, Church and Union Streets, Stockade Historic District, Schenectady, NY. "The City that lights and hauls the world" was synonymous with economic expansion for decades. Fueled by the growth of the middle class, the city's neighborhoods, including the GE Realty Plot, Hamilton Hill and others enjoyed high rates of homeownership and vibrant commercial corridors. The community was, and still is, enhanced by the presence of Union College, the Stockade District and other historic and heritage resources unparalleled in the region. Essentially a two-company town for most of its history, Schenectady is distinctly different from its neighbors in the Capital Region. All are industrial cities, but while industry was booming at the confluence of the Mohawk and Hudson Rivers well before the Civil War, Schenectady did not achieve such a standing until the 1880s. The remarkable expansion of the General Electric Company between 1890 and 1920 conferred a unique, twentieth century quality on the physical character of the City, virtually bereft of the dense, attached rows that characterize streetscapes in Albany and Troy. GE brought change to Schenectady at a magnitude few cities ever experience. Known as "the City that lights and hauls the world", in 1914, more people worked at GE than had lived in the entire city before the company was created. GE's main plant developed into a mile-square city-within-a-city, and extraordinary demand spurred rapid housing development in adjacent neighborhoods. Although downtown State Street was the "preferred address" for many local businesses, from the elite classicism of Proctor's Arcade to the streamlined economy of Woolworth's, more personalized services, such as groceries, bakeries, butcher shops, taverns, and tailor's shops, could be found on the commercial strips in Schenectady's proliferating neighborhoods. For decades, GE and ALCO were Schenectady's two major employers. Through the world wars, the City's factories were used in the production of heavy military equipment and trains for transport. Following World War II, however, the economic character of the City underwent rapid change. As railroading declined in the U.S., so did the prospects of ALCO, which ceased operations in 1970. General Electric's gradual decline in the later decades of the 20th century confronted the community with tougher challenges than most cities ever have to face. The transition from a company town, to a city with a diversified economy, strong and productive tax base and vibrant downtown has been an ongoing process for Schenectady, as it has been for other cities in the region including Albany, Troy and Amsterdam. City of Schenectady Comprehensive Plan 2020: Reinventing the City of Invention, 2006, www.cityofschenectady.com, accessed October 2007.